West Londo Lake is a 190 acre all sports lake! It is nice and clear and great for swimming. You can swim off our dock, go to the park or go to the east side of the lake, to the sand bar in the pontoon boat. Our pontoon boat is available for $400/weekly or 60/day in the off-season. 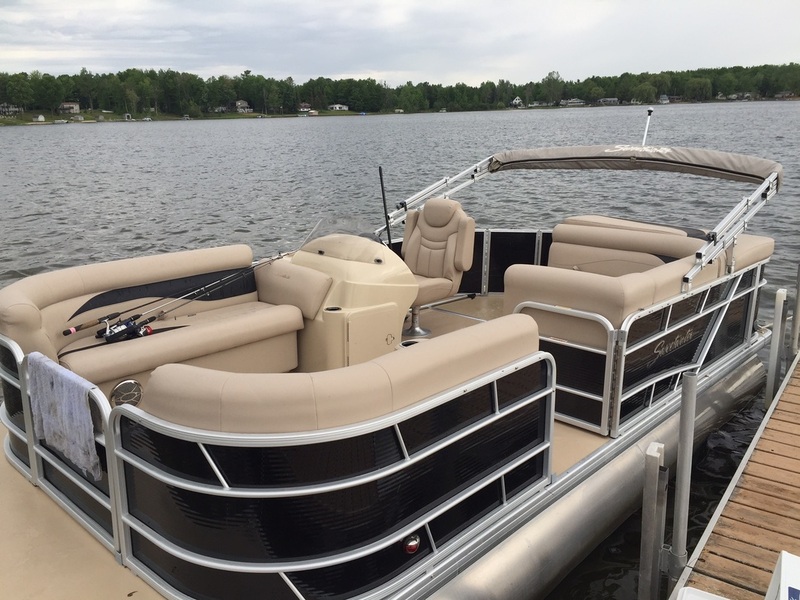 It is a 2015 20 ft Sweetwater pontoon boat. The boat is powered by a 60 HP Suzuki outboard motor. The boat can be used for tours around the lake and fishing for the many species of fish. West Londo lake is an incredible fishery. Some of the biggest Bass we have ever caught were caught on this lake. There is also lots of Hammer Handle Pike. Bluegill, Sunfish and Perch are perfect to keep the kiddoes (adults too) entertained. Bullhead are also in abundance after the sun goes down from our dock. For many, many years, West Londo Lake has been home to a nesting pair of loons. Every year, the loons come back and can be seen on the lake. In the center of the lake is a island where they nest. You will enjoy having a bonfire listening to the loons make their calls at night.